The Sonntag Elementary Laser Tag and Game Truck party was a big hit again this year. They had us out again for their annual 5th grade end of year party. 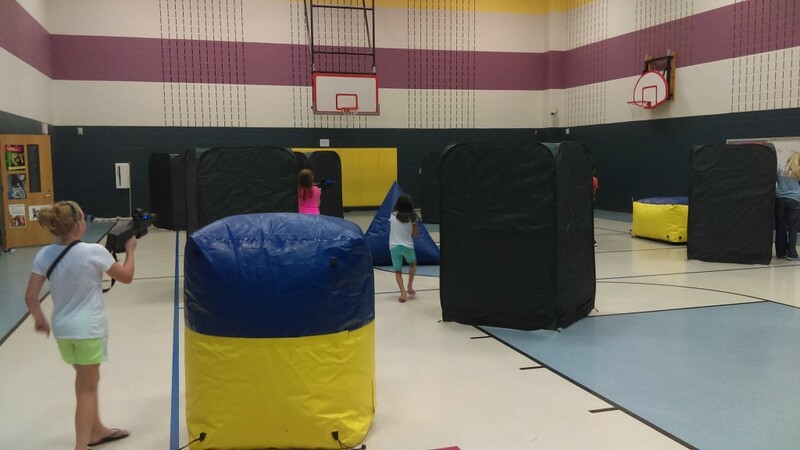 While the Game truck was out front, we set up the Laser Tag in the gym, which worked out well as it was storming outside and the players were able to have fun and keep dry. We filled up the gym with our inflatable obstacles as well as a few of our pop-up bunkers. Our new scoring software kept the games moving in a timely manner as well as providing feedback on who the winning team was and who were the leaders on the team. The kids played from 11:00 am until just after 1:30 and would have happily played more if we had not run out of time. Having a gym available to set up in made for a nice environment for the players. Not to hot and on this day, more importantly, it kept everyone out of the rain! We look forward to going back to Sonntag next year and meeting a new batch of fifth graders as they celebrate the end of their year and look forward to moving to their new school. We can’t think of a better way to cap off the year then to blow off a little steam playing video games and Laser Tag! We know these kids sure enjoyed themselves. We would love to bring this type of excitement and fun to your school. Check out our websites, www.ntxlasertag.com or www.ntxgaming.com. We have several combo events coming up and we would truly enjoy playing with you and your kids as well. Also, check out our Facebook and Google plus pages.